One of the biggest issues I’ve had with homeschooling is trying to fit everything into my day. The schoolwork. The housework. The cooking. Keeping the babes busy (and happy). The laundry. Preparing for church ministries that I run. Making sure my reviews are on time. And then of course there’s my husband- the workaholic love of my life who lately has only been given whatever leftover energy I can muster at the end of the day. My disorganization and lack of daily rhythm has cost us peace in the house, missed opportunities to help others and (worst of all!) the almost total loss of a love life. At the precise moment that I was nearing my emotional breakdown, I was offered a book from Real Life Press to review entitled, The Busy Homeschool Mom’s Guide to Daylight. Real Life Press is Heidi St. John’s Company. Heidi St. John! The Busy Mom. If you don’t know who she is, I implore you to visit her blog and get to know her. She is an encourager among encouragers and an essential resource to any mom, homeschool or not. You’ll laugh out loud, learn some of Heidi’s favorite tips on everything from homes organization to meal preparation, and discover how you can homeschool in freedom and joy. To homeschool freedom and joy. That was what I wanted, what I needed- what my family needed. From the very beginning of the book, you feel like you’re sitting down with a friend over a cup of coffee. Heidi writes with wit, humor and raw honesty. Just two pages in and she had described my life in two short sentences. It seemed that just when I got something down in one area of the house, another would need improving… I was homeschooling alright- but that was it. The rest of my life was unraveling. That was my problem! I was trying to create schedules modeled after other homeschool mamas who were not in the same season I am. I have two preschoolers and a baby!! That makes a huge difference! I can’t model our day after a family that only has three kids who can all feed themselves! One roadblock to developing a POA for your day may be your lack of organization. It’s difficult to create a successful rhythm to your day if you are surrounded by chaos, clutter and excess. They are the enemy of a peaceful, organized home. By chapter two I was convinced that Heidi was actually writing this book about my life- not hers. So much wisdom and ideas are expressed that I had a hard time choosing where to start. In the layout of our house, the formal dining room and living room are the first areas you see when you walk into our home. And it just so happens that rooms have been turned into our not-so-formal school room. Yes, our schoolroom mess is the first thing you see when you walk in, which means that my blood pressure would rise every time I came home. For that reason, I decided to start project De-clutter with the schoolroom. It took two whole days with four of us working on it but we did it!! I had bags and bags and boxes and bags to give away! Our schoolroom now has an easy flow with organized bookshelves, de-cluttered desks, and organized toys!! Get this… there’s actually room to walk!!! The whole house is far from done but it’s definitely a start! Each day, we are given the chance to spend the gift of time as we see fit. Some days, we spend it better than others and joyfully announce the list of things we accomplished on Facebook. Other times, we waste the time we have been given and it leaves us feeling defeated and frustrated at the end of the day. Yep, she got me again. After reading this chapter I realized that not only has my life been unorganized but it has also been unprioritized. I would make lists every morning of what I wanted to get done and randomly do them. The problem wasn’t that whole listed didn’t get done but was that I was completing tasks that could wait instead of doing the things that really should be done one that day. Heidi shows you how to prioritize your day beginning with spending time with the Lord and going from there. 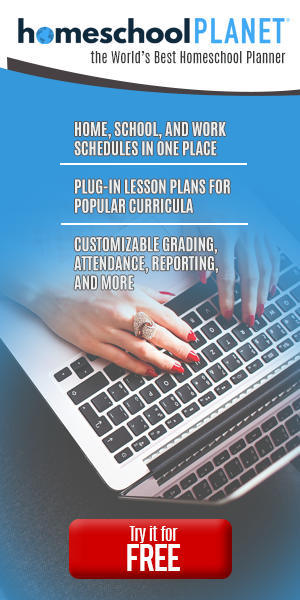 There are a multitude of sample schedules and charts to look at and glean from. Thankfully, that is one area of my life that I don’t have issues with. I am the master of the crock and freezer cooking! I menu plan with the best of them! However, if you aren’t quite there yet, Heidi walks you though how to feed your family and not lose your mind. From crock pots and freezer cooking to menu planning, picky eaters and teaching your kids to cook… she covers it all. Failure. We’ve all experienced it. Failure to follow through. Failure to respond with love. Failure is an essential part of success… it sends us back to the drawing board. This chapter is laced with encouragement and grace. She builds you up and sends you to where you can be filled up… God’s word. This was perhaps my favorite chapter. Heidi talks about being overwhelmed by life in general and how she got turned it around with LIFE. Is that brilliant or what? If the contents of this chapter were the entirety of the book, I would purchase it over and over. Yes, it’s that good. Obviously there other time wasters that I partake of during the day but Facebook is the biggest one. Seriously. I bet I check FB 100 times a day. Heidi gives great advice about not letting things like that be a hindrance during your day. And as always, there’s scripture to back it up. This chapter is vital to every homeschool mama. We as homeschool moms put ourselves under a great deal of pressure. Pressure to outperform. Pressure to look like other families. Pressure to make our own bread after grinding our own wheat because Suzy does it, so shouldn’t I too? Heidi speaks honestly and candidly about the enemy of your soul and his plans for your life. Are you listening homeschool mom? Are you watching? Are you on guard against the enemy of your soul? You need to be; because the battle you are in is for the hearts and minds of your children. A generation hangs in the balance. 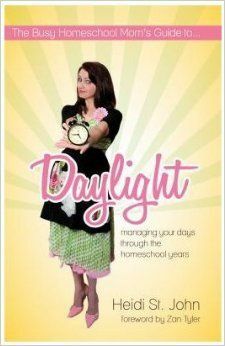 If I could give a copy of Busy Homeschool Mom’s Guide to Daylight to every homeschool mom I know, I would. It’s practical. It’s applicable. And above all else, it’s encouraging. If you read one homeschool book this year… make it this one.